Gathering My Roses: Select Comfort In Balance Pillow Protectors: CLOSED! Select Comfort In Balance Pillow Protectors: CLOSED! Old song... true story. Both Mike and I tend to toss and turn at night. It's a constant battle with the pillows, too. In the heat of the Southeast Georgia night, we're constantly flipping the pillows to get to the "cool" side. Frankly, we're fighting the pillows more than sleeping. From May to October -- the battle rages on. That's why I was so excited to receive two Select Comfort In Balance Pillow Protectors for review. It didn't take long at all to appreciate the new In Balance Pillow Protectors. In fact, it only took one night. Even though Mike and I both wear our hair short, we both have thick hair and it gets so darn hot on our pillows. But not with the In Balance Pillow Protectors. They kept us cool and we weren't constantly flipping and turning the pillows to find the "cool spot". Literally, what a welcome relief! I'm convinced. I had a much better sleep experience than I've had in many a long night. Mike, too. The heat absorption process of these pillow protectors is amazing and it works. I'm satisfied. No. I'm gratified. As someone who sufferd with chronic insomnia for years, I am greatful for any product that helps me get a good night's rest. Select Comfort is famous for it's extensive research and product development. They really do care about their customers health and well-being. That's important to me. No more flipping, looking for the 'cool spot' - this protector can maintain a cooler sensation. 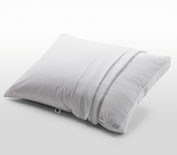 Our classic-style pillow protector features Outlast®* (*Outlast is a trademark of Outlast Technologies, Inc.) temperature balancing material, designed to reduce the temperature swings that can cause restless nights. Outlast® material absorbs excess heat as it's created and releases it as needed. So there's no need to flip your pillow-it stays just the right temperature all night long. 300-thread-count 100% cotton. Zippered closure. Hypoallergenic; perfect for allergy sensitive individuals. So... what is Outlast® Technology? 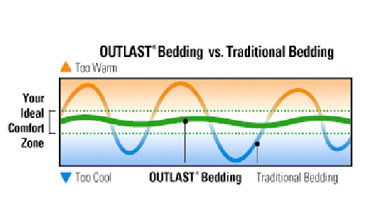 Sleep Number bed products incorporating Outlast® Technology continuously interact with the unique microclimate of the human body and the environment to moderate temperature from being too hot or too cold. Not Too Hot, Not Too Cold®... Just Right! The wonderful folks at Select Comfort have generously offered our followers a chance to win their own set of Seelct Comfort In Balance Pillow Protectors! MANDATORY ENTRY: Visit Select Comfort and tell me another item that you like, please leave a link to that item. 1. Follow Sleep Number on Facebook and post on their Wall -- tell them Terri & Liz from Gathering My Roses sent you! 4. Connect with Select Comfort on their Beds Blog and subscribe to their RSS feed! 9. Grab our button and post it on your sidebar or favourite's page! This contest will be open from Thursday, June 24th until Tuesday, July 6th. Winner will be announced on Wednesday, July 7th. DISCLOSURE: We received a complimentary set of Select Comfort In Balance Pillow Protectors for the purpose of review. We were under no obligation to review these items. We did not receive any monetary compensation. The opinions expressed herein are our own and based on our own personal use of and experience with the items. FB fan sleep number and wrote on their wall. Lakeshore Blue Bedding Set is really pretty. I would love the i8 sleep number bed; http://www.selectcomfort.com/eng/products/sleep-number-beds/innovation-series/i8/i8_bed?i8. I would like to have the Lyocell Down Pillow! Entered the New Balance giveaway. I also like the Pima cotton sheets. I also would like to have the Down Alternative Pillows. I'm following Sleep Number on Facebook and post on their Wall -- tell them Terri & Liz from Gathering My Roses sent me. I'm following @GeorgiaMist on Twitter. I'm following @SleepNumberDeal and @SleepGeekPete on Twitte. I like the Classic Plush Blanket. In Balance Layer Mattress Pad looks cool also. wrote on sleep number fb that you sent me! Um, I would love a mattress by sleep number!! I follow Sleep Number on FB as Sun Dance and posted to their wall. I subscribed to the Sleep Number Beds Blog RSS feed through iGoogle. I'd love one of their beds! i like the luxlayer mattress pad. I would like to try the True Silver Sheet Set. Looks so comfy! I also like the Lyocell Quilted Sheet Sets! I'm following your blog publicly on Google Friend Connect -- Thanks again! I would have to go with the "LuxLayer Mattress Pad with Comfort Foam" (http://www.selectcomfort.com/eng/products/pillows-bedding/mattress-pads/luxlayer_mattress_pad_with_comfort_foam?luxmpcom) I think it would help out with the back issues I've been having! Thanks so much for the chance to win this set of pillows!! I also like the Lyocell Down Comforters w/Organic Cotton Cover. I follow @SleepNumberDeal and @SleepGeekPete on Twitter as suebaby05. I follow GeorgiaMist on Twitter as suebaby05.